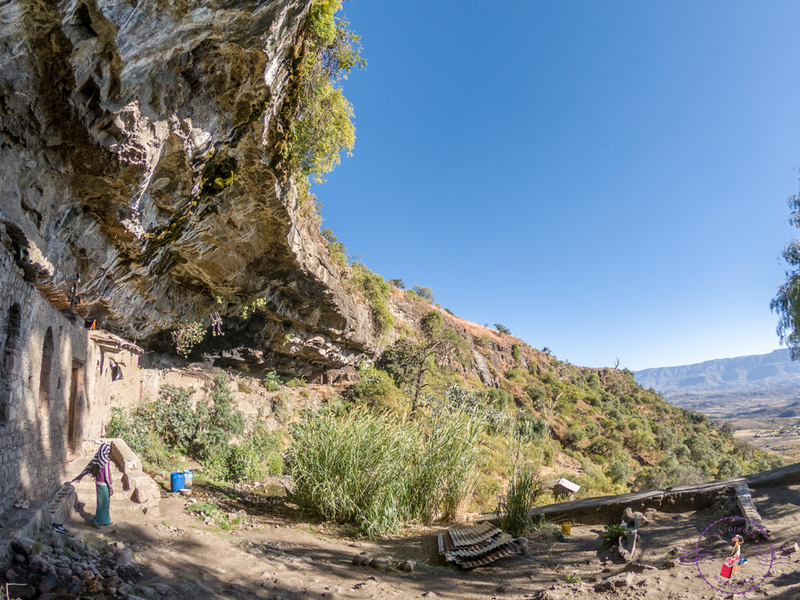 A bumpy 42 km ride away from main town Lalibela lies a hidden gem: a little church known as Yemerehana Cristos. 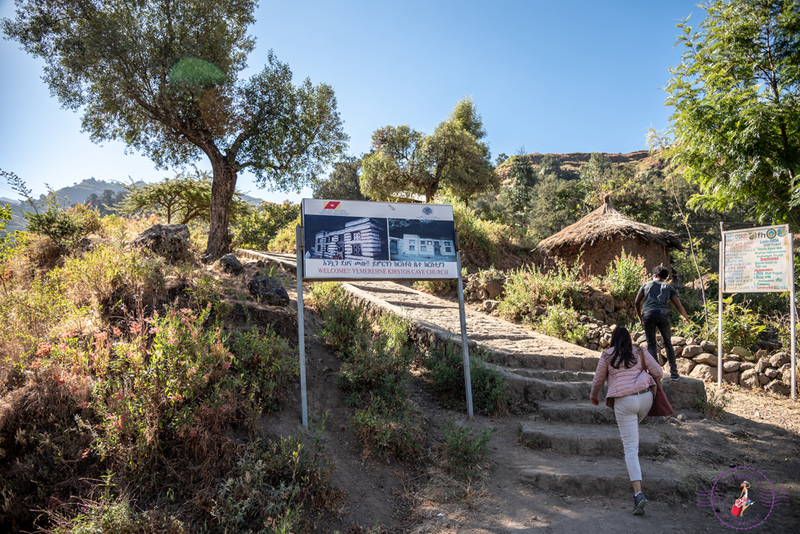 We head into our 4×4 with Bruk our driver and Abrham and make the journey through the mountains of Lalibela along a bumpy murram road interspersed with tarmac here and there: roadworks are ongoing so many of you will be able to make the trip on a smooth road now. An hour later, we arrive in the village of Yemerehana: the base from where we will make the ascent up to the church. It is a steep climb up a path in a shaded forest of juniper trees, with monkeys jumping around. My iWatch at the end of the hike shows an elevation gain of 90 for the 1 km trek which means we went quite high in a short amount of time. I am struggling a little bit but at the same time I can feel myself getting stronger not only physically but also mentally with every step I take: but once again, I am making mental checklists to start to incorporate more exercise into my otherwise sedentary lifestyle when back home! Twenty minutes of walking later, we approach an ugly wall beyond which is a cave in which the church of Yemerehana Cristos sits in all its glory. The church is beautiful. 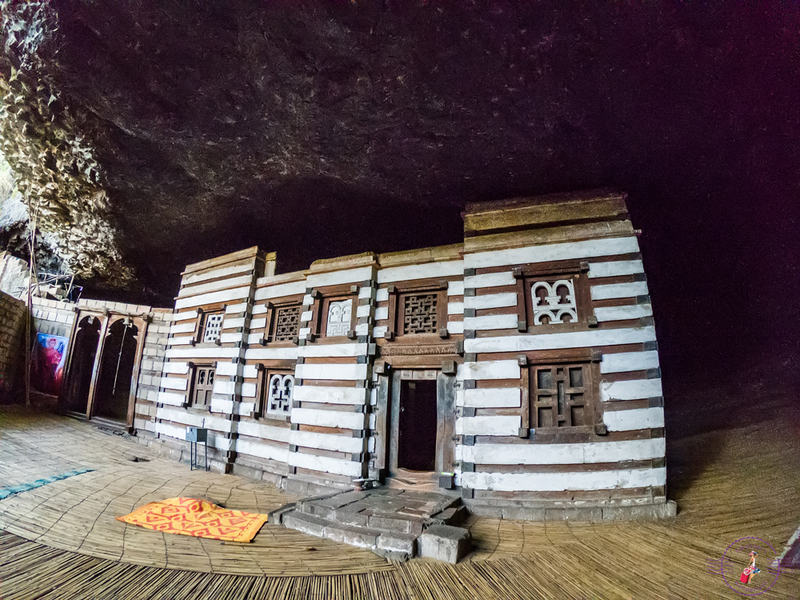 Set inside the cave, this is one of the first churches to be constructed from the ground up rather than excavated and is one of the best preserved late Aksumite buildings. The building is set on a carefully layered bed of olive wood panels and the main structure has layers alternating between marble and wood, which gives the illusion that the church is floating when seen from a distance. The floor beneath my sock clad feet is damp and cold and I am grateful for the bamboo matting that alleviates this somewhat. 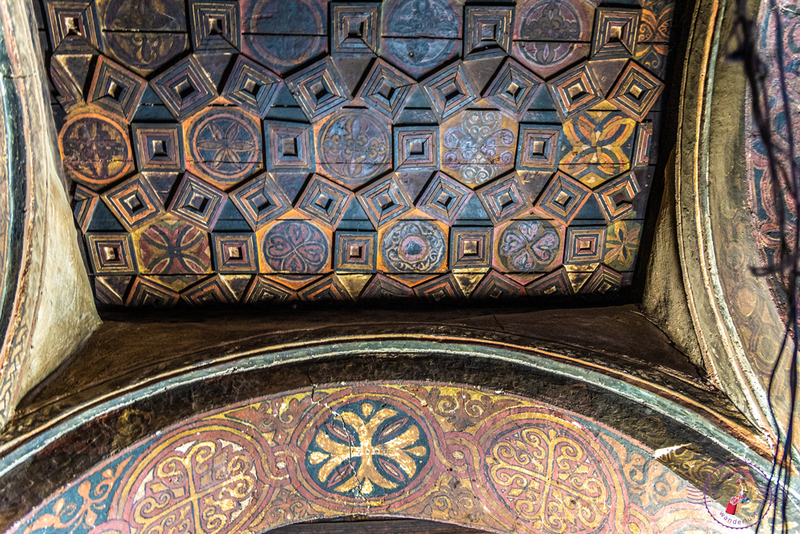 The inside of the church is something spectacular, its ceilings adorned with vividly coloured frescoes. They are so well preserved which I suppose has something to do with it being so cold inside the cave. Though the interior is dimly lit, the light of the candle that the priest is holding casts a magical warm glow and as I say a little prayer for my little cousin brother that we lost a month before my travels, I see that the flame starts to glow in the shape of a heart. I am honestly moved and I feel a sense of calm wash over me as I listen to the priest’s voice chanting prayers for us in Ge’ez. I feel the need to light candles and say a little prayer for all our loved ones in Heaven every time I go in to a church or a temple: and the candles lit out in Yemerehana Cristos are indeed special. The cave is both mysterious and eerie at the same time. I suppose the energy here is off the rails because it was a place where pilgrims would make their final rite of passage and come to die, being buried at the back of the cave itself. This isn’t the practice any more but you can still see some well- preserved mummies if you fancy but I get creeped out by these things and prefer not to look. Some fears I am happy not to face! We leave the church and the priest leaves with us, locking up for the day. He says that this church isn’t popular at all and so if someone else comes, he will open it for them but for now, he is off home. We leave through another route, and it would appear that word has spread that there are visitors at the church for the path back down has villagers begging for money and little children wanting chewing gum. Sadly we have none, and we would have been happy to give them a few Birr but Abrham discourages us saying that this will only alleviate the problem and not help. Maybe pens and books would be better and I wish I had some, but now I know what to take with me when we travel to such a region next! 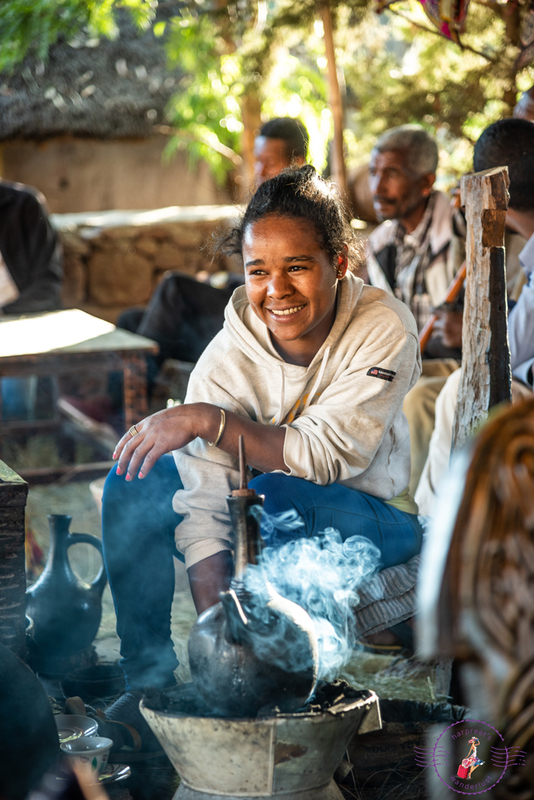 Back at base, Abrham says it is buna time: we have earned ourselves a cup of freshly brewed coffee, to have alongside some kitea, a sweet bread and some home-made injera and berbere chutney after our morning of exploration. We sit in the terrace of a locals house, sipping on this liquid gold from little cups and was share this humble yet delicious meal with Bruk and Abrham, tearing off injera from a common tray, each from our own corner. It is culturally acceptable in Ethiopia to eat off the same tray and is greatly encouraged: and I must admit that at first I found it awkward do this but we have now become friends, and so it feels pretty natural to be eating and chattering about our experiences that morning and truly appreciating this cultural quirk. 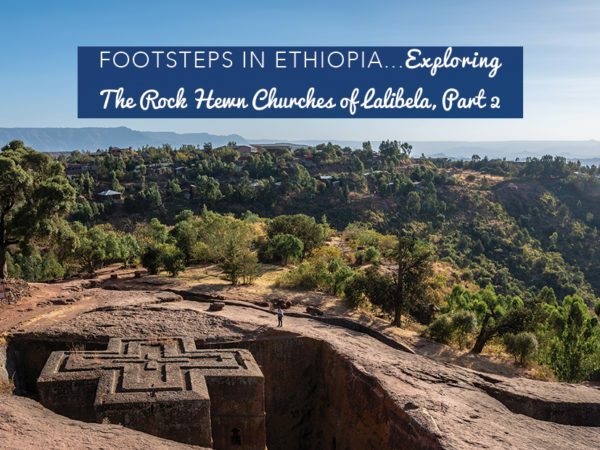 Based just off the road towards Lalibela airport lies the ToNeakutoleab Monastery. 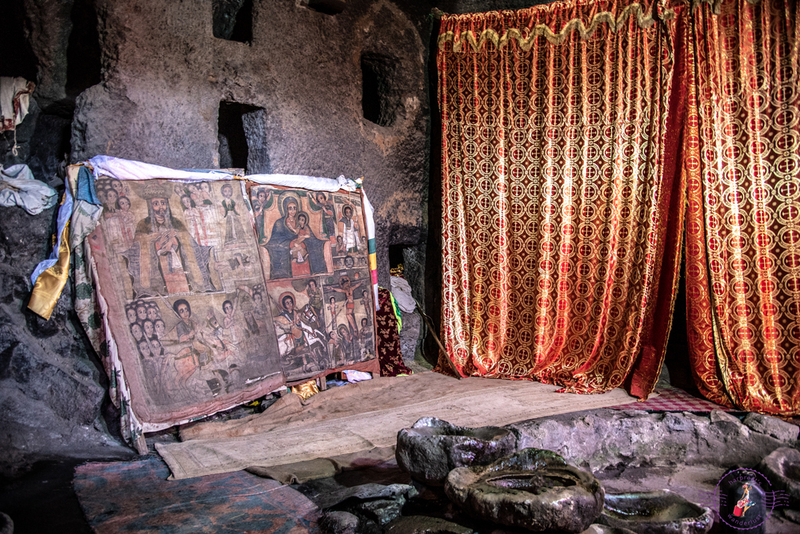 Set in a cave in the most gorgeous surroundings, this tiny church has been in existence for centuries and the pull here is not so much for the church but for a sprinkling of water that has no source and so is considered holy and believed to heal. 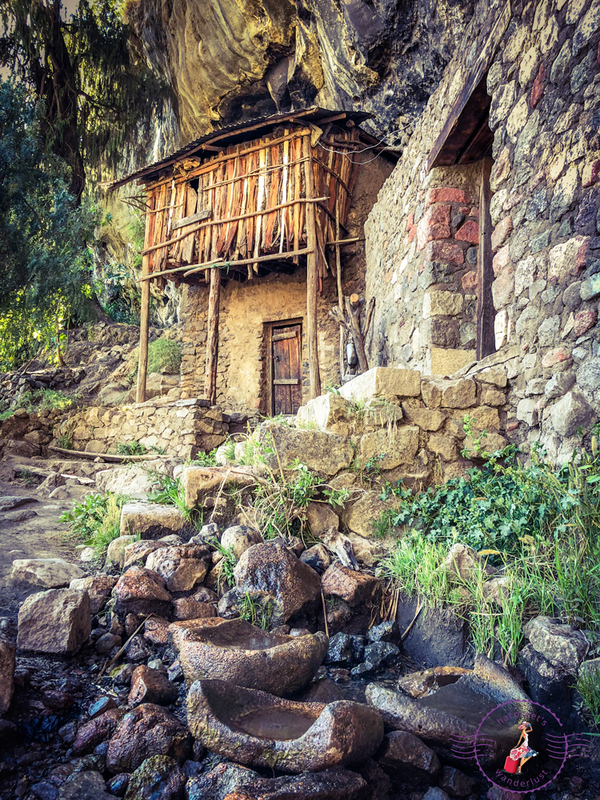 Centuries old stone receptacles are lined up to collect this precious liquid and locals come to collect water from here on a daily basis. I look around and the scenery is visually stunning. 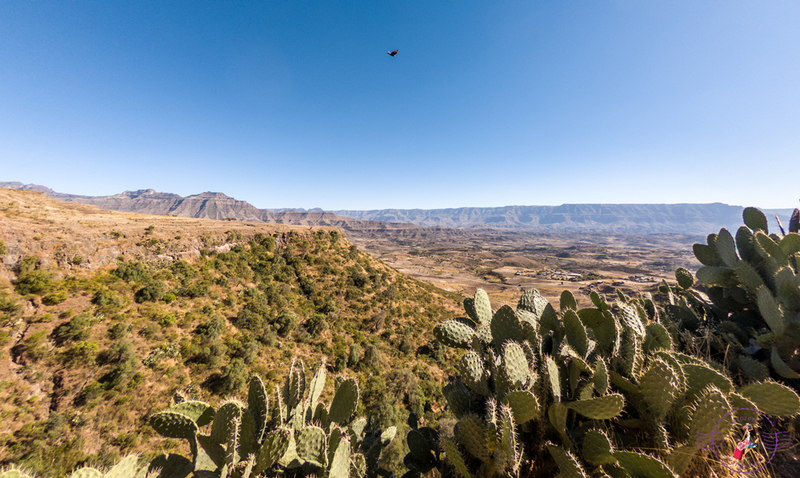 The dry and arid landscape stretches on for miles with the mountains on the horizon looking like they have been chiselled by hand. 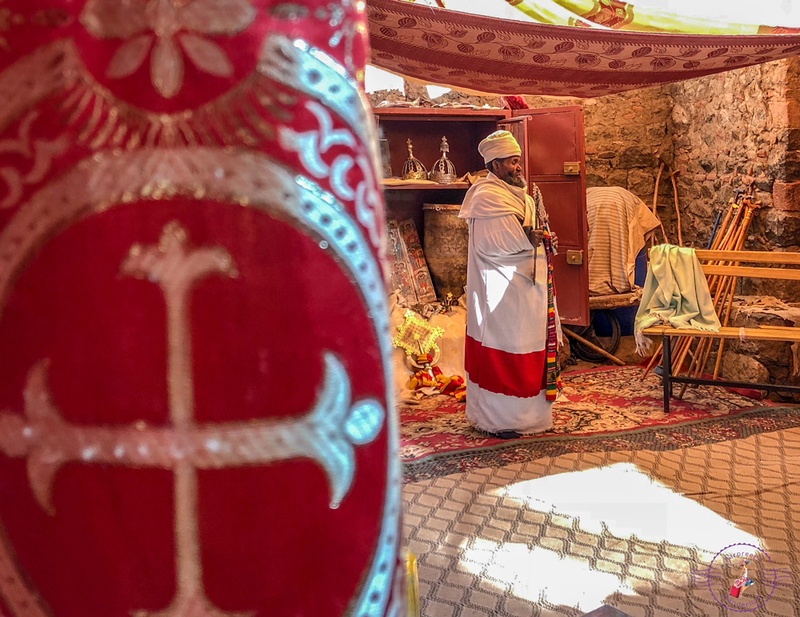 The Monastery has a large collection of crosses and religious artefacts that are considered ancient treasures and the priest, who has just finished conducting a prayer ceremony for a local family is happy to show these to us. 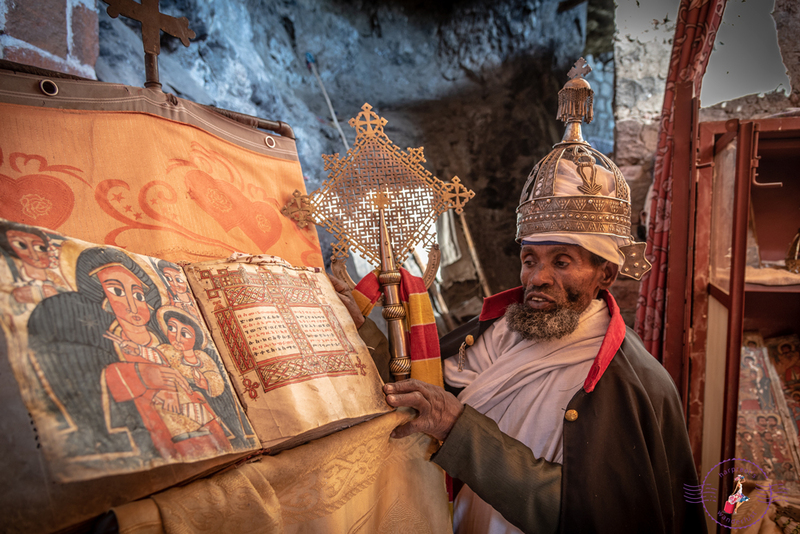 One is an Amharic Bible made with parchment and lettered by hand: its colours are so vivid that they look freshly painted and not eons old! 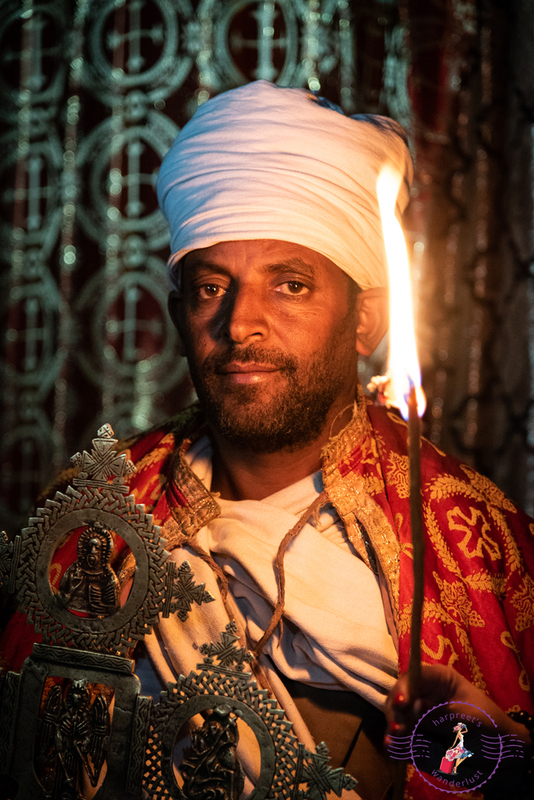 As he turns the pages of the Bible, the priest chants some of the prayers and Abrham says that he has done a little blessing for us which is really nice: I must admit that I have no idea of the context but blessings are always welcome and so we leave the priest some Birr for his efforts before we leave the Monastery. Coffee is to Ethiopia what tea is to England. Until I set Footsteps in Ethiopia, I was a tea addict. I must admit this was mainly because I had never tried coffee that I absolutely loved and so my default love was for tea. And then, I was introduced to the world of Ethiopian coffee and I haven’t looked back since! 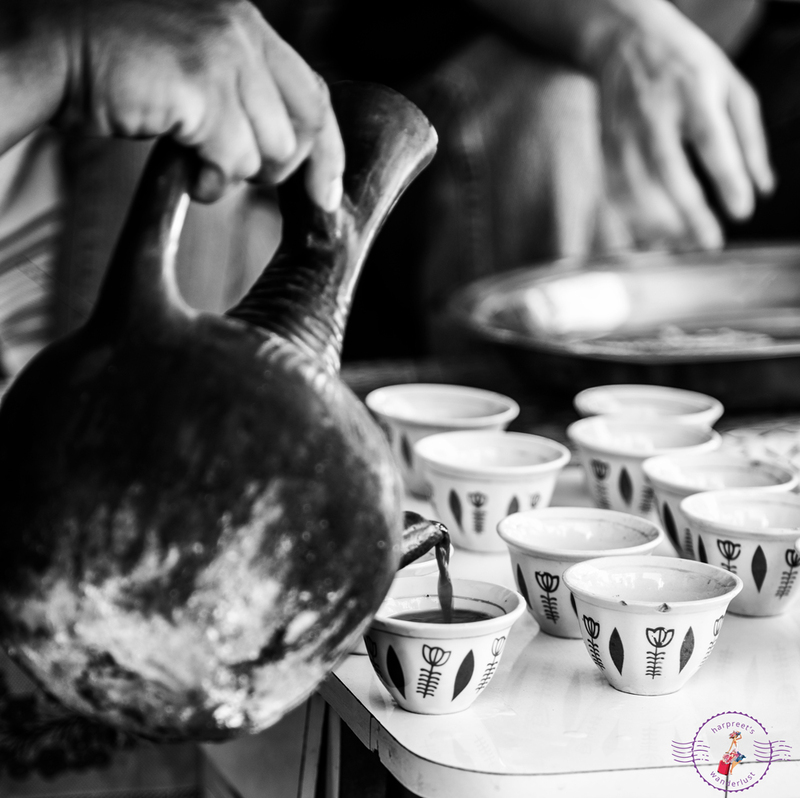 Coffee ceremonies are part of the backbone of Ethiopian culture and occur frequently throughout the day. Green coffee beans are roasted over an open fire in a pan until they emit these enticing aromas, before they are freshly ground and placed into a stone teapot like receptacle with water and brewed over a coal fire. The result is a thick black liquid that you drink as you would an espresso: and it is absolutely delicious, akin to liquid gold. 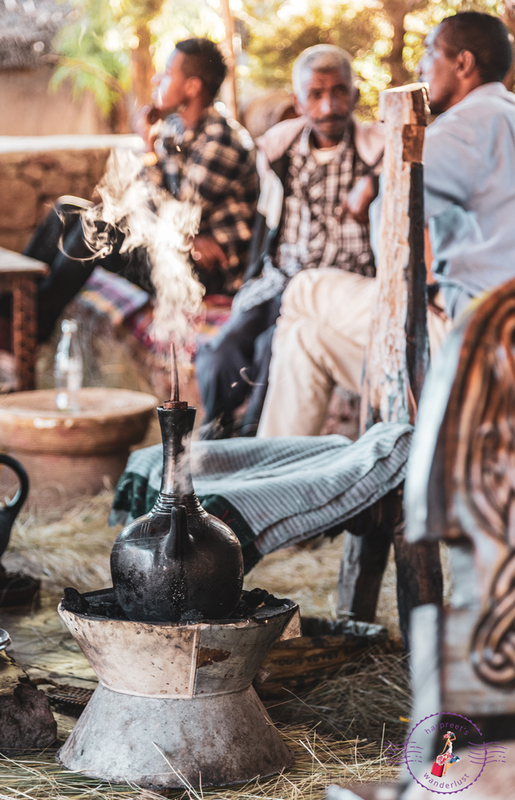 Locals take their coffee, also known as buna very seriously and so little coffee houses and open air roadside shacks are thronged at coffee time with locals waiting impatiently for their fix, munching on bowls of popcorn as they wait. Because you can’t rush a good thing…it takes time, and once a batch is brewed and finished, you will wait a while before the next one: and it is worth every second! 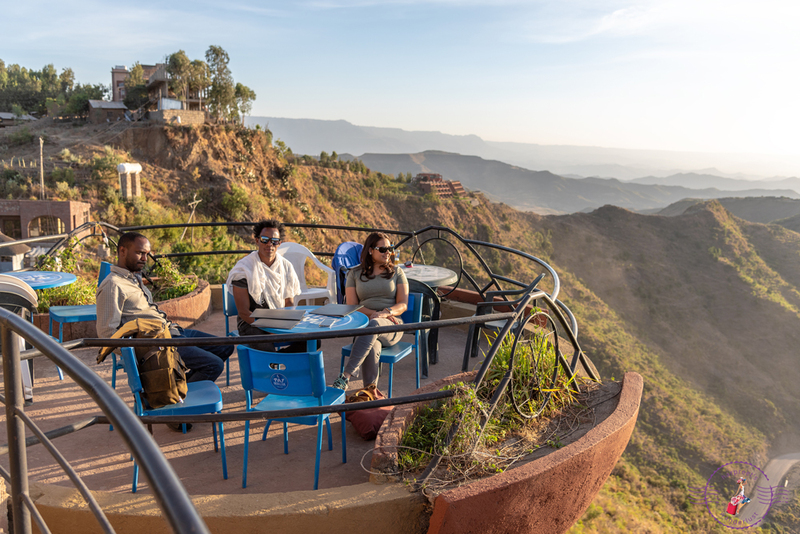 I am loving observing the locals nattering away as we all wait in main downtown Lalibela for our fix, before we head out for sundowners and a night on the town! 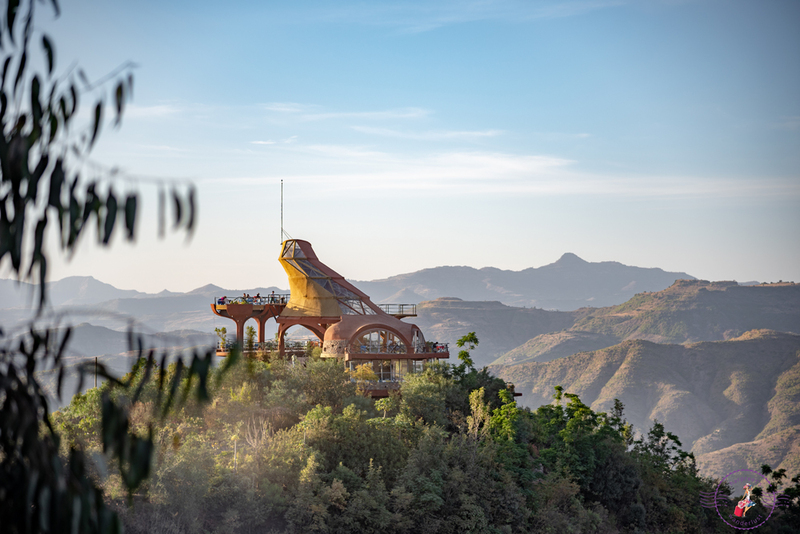 When we first arrived in Lalibela, I couldn’t help but notice this rather strange shaped building in the distance. I had read about Ben Abeba but I could never have imagined that it was this quirky flower shape until I actually saw it up close because it looks nothing like a flower from a distance! 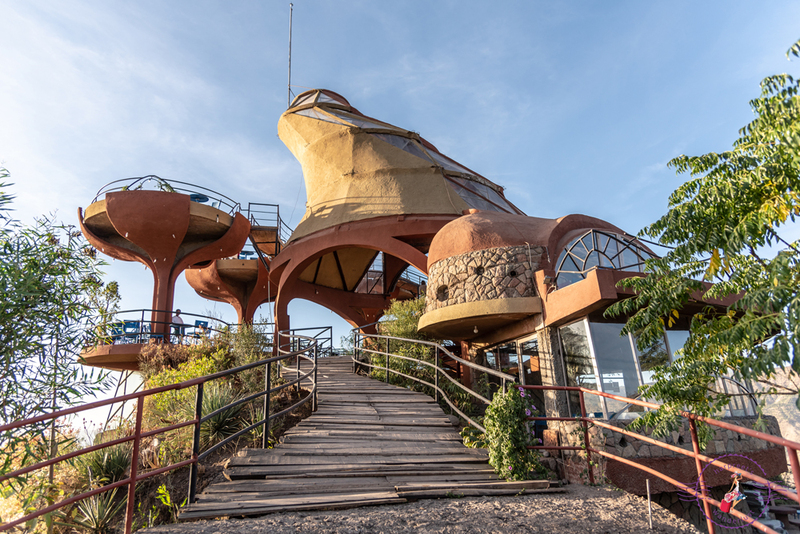 In any event, it has some pretty high terraces that offer amazing vantage points from where to appreciate the vast beauty of Lalibela and sunset is the perfect time to indulge in an “explorer”: the house cocktail of gin and homemade lemonade sipped whilst wrapped up in a cosy blanket. 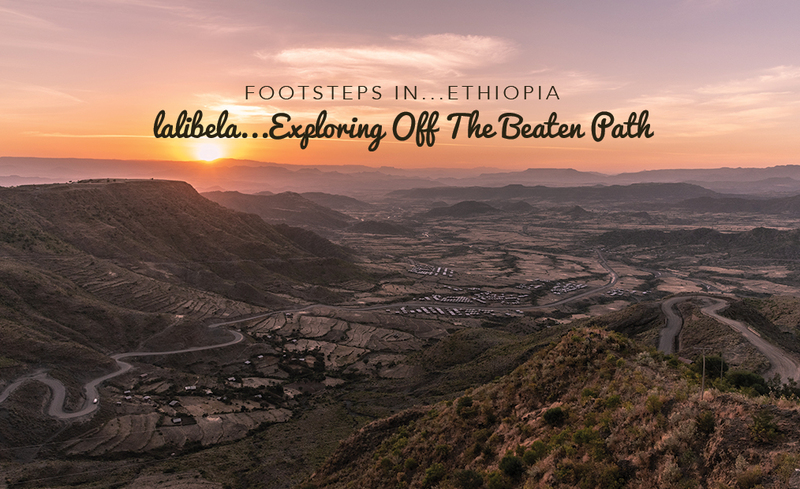 An evening at Ben Abeba is special, watching the sun melting into orange nothingness over the landscape and day turn into night, capping off yet another beautiful day of wanderlusting. Painting the town red at Torpedo! 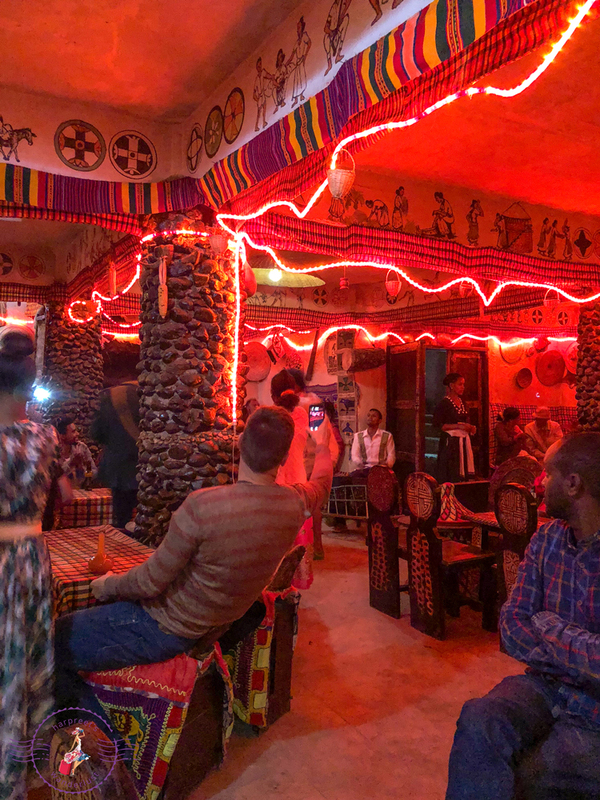 We cannot end our sojourn in Lalibela without a night on the town and so, after dinner we head out to Torpedo, a local bar where everyone comes to hang out at to drink Tej: honey wine. 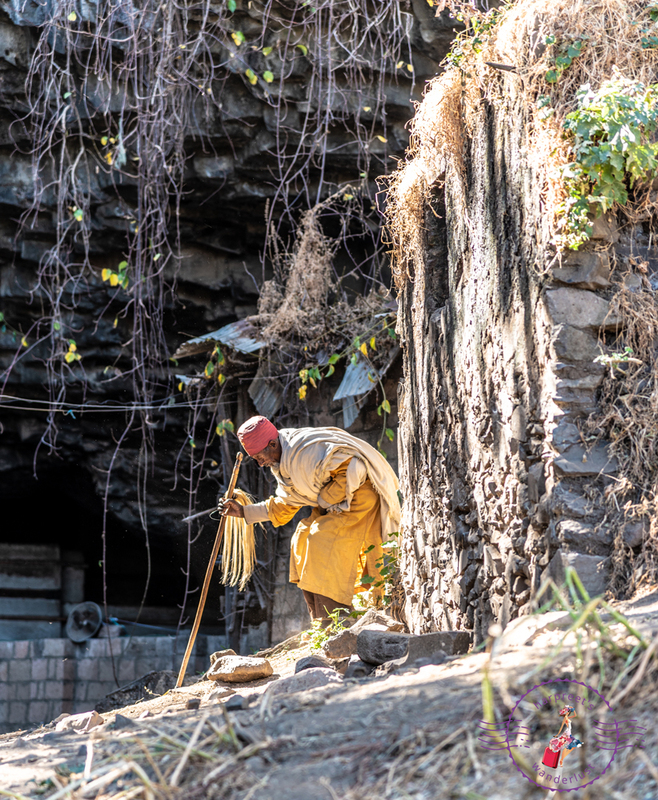 Lalibela is the home of Tej, which is made with local red honey and brewed like beer with hops, barley, sorgum and other grains and left to ferment for three months before being served up in four different strengths: soft, medium, strong or special. 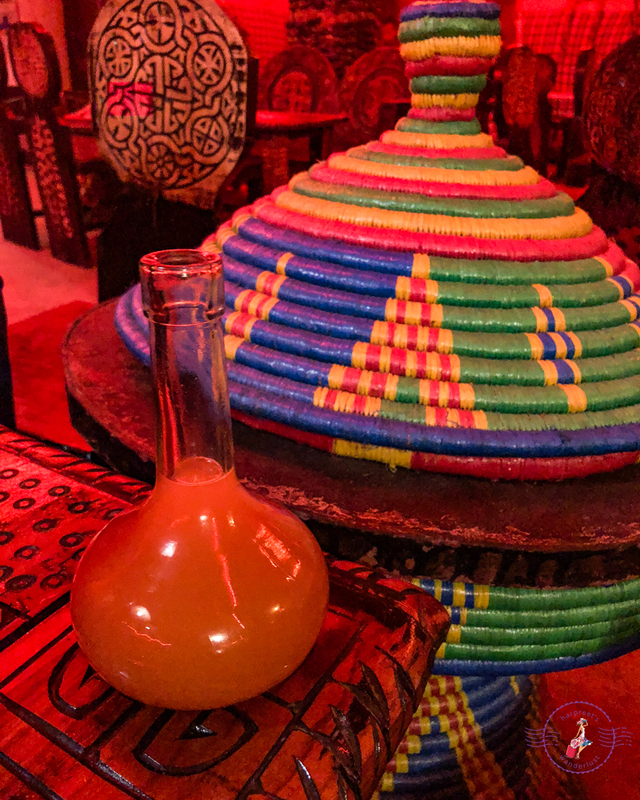 Served in a contraption that looks like a round bottom flask in a chemistry lab, this drink tastes deceptively like melon juice with a beery aftertaste and I think it is very much an acquired taste: I managed one flask and wasn’t hankering for more! The atmosphere is like that of a night club: dim lighting and tables set to socialise. A musician is walking around strumming his Krar and dancers energetically performing the local shoulder dance, picking people at random to dance with them. As the night goes on, the drunken merry makers start to plaster money on the foreheads of the musician and the dancers as a sign of appreciation! 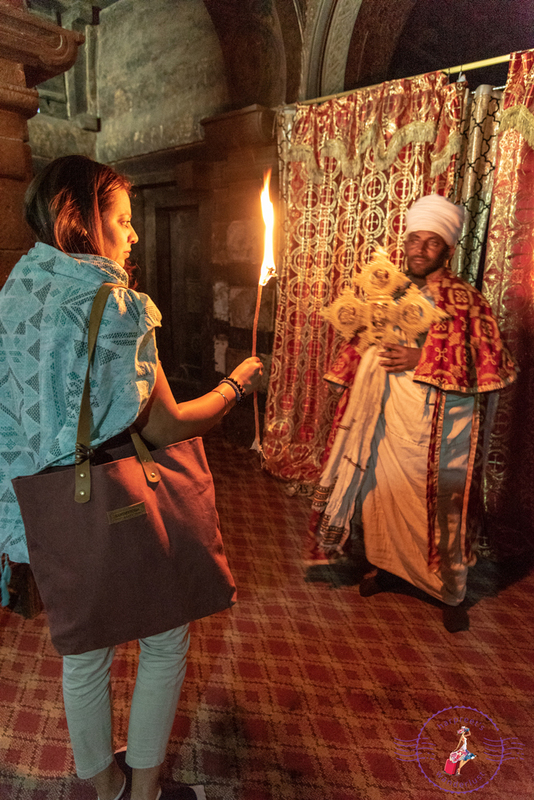 We have a flight to catch to Gondar the next morning and so decide to call it a night…Lalibela has been fabulous and we are leaving with beautiful memories of our time here. 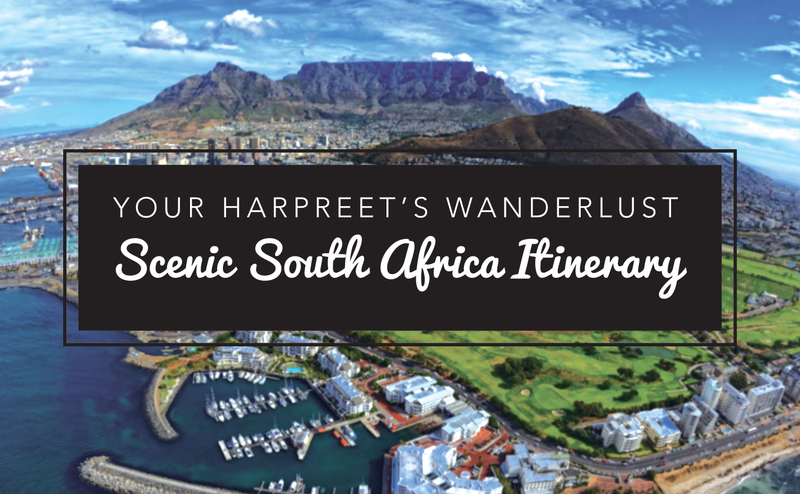 Note: if this post is read on any other website save for https://www.harpreetswanderlust.com, it is stolen content or reproduced without my permission and I would appreciate being contacted. Thank you! The post is gorgeous and makes me want to go there. This looks like an article out of a travel magazine. Thank you so much Damyanti! 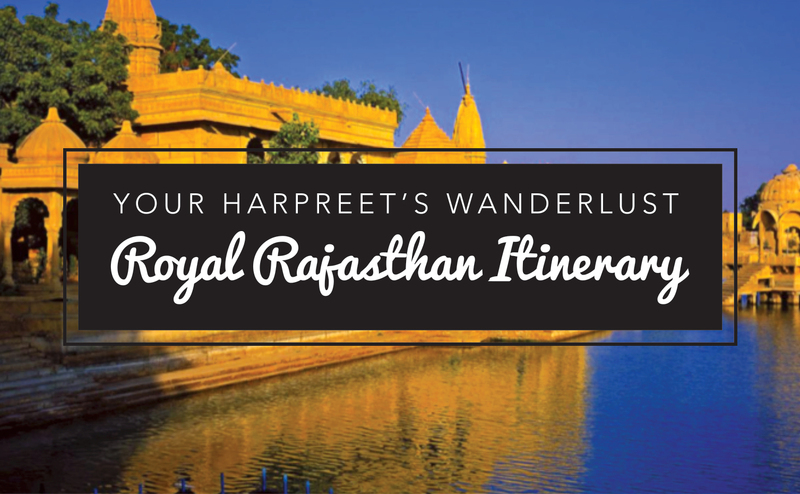 I am so glad you enjoyed it and flattered that you think it is like something out of a travel magazine – that makes the work that went into writing it all the more worth it! 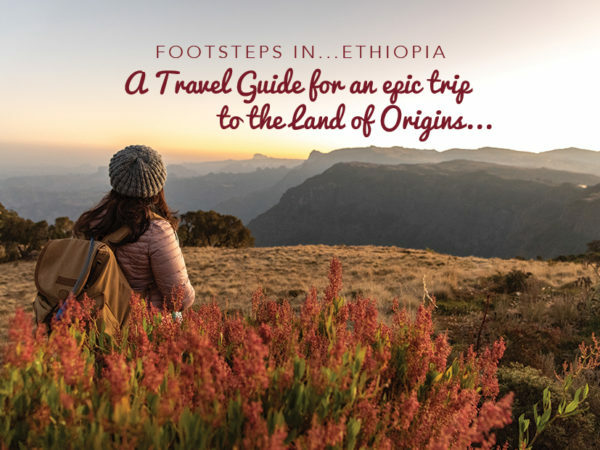 Have a look at the other posts in the Ethiopia series – my epic travel guide highlights everywhere we went and puts the trip into context. Thank you again! Love the photographs and the way you’ve covered these places. 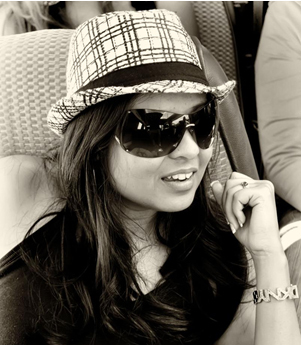 I agree with Damyanti; it felt like I was reading a piece in a travel magazine! Awww thanks so much my lovely! Makes me so happy to read such comments and humbles me to think you guys think that these pieces are worthy of being in travel magazines! OK Harpreet, I’m in awe. 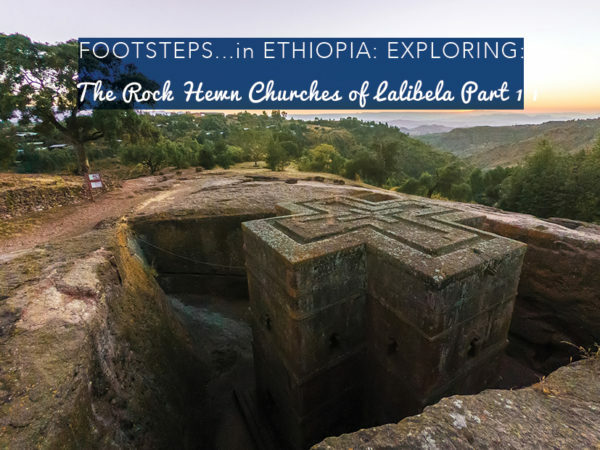 I recently watched a documentary about this and Lalibela and now I just have to go. Your posts have just consolidated this has to be on my list of places after I finally make it to Kenya! Thank you so much Bejal! I am so glad to have inspired, makes all the work that goes into curating the posts totally worth it! So much more content on Ethiopia still to come, stay tuned…and I can’t wait for you to come to Kenya so that I can finally meet you! Glad you think so! I hope you get to go someday! Thanks for stopping by Francesca…I hope your dream comes true! Wow! 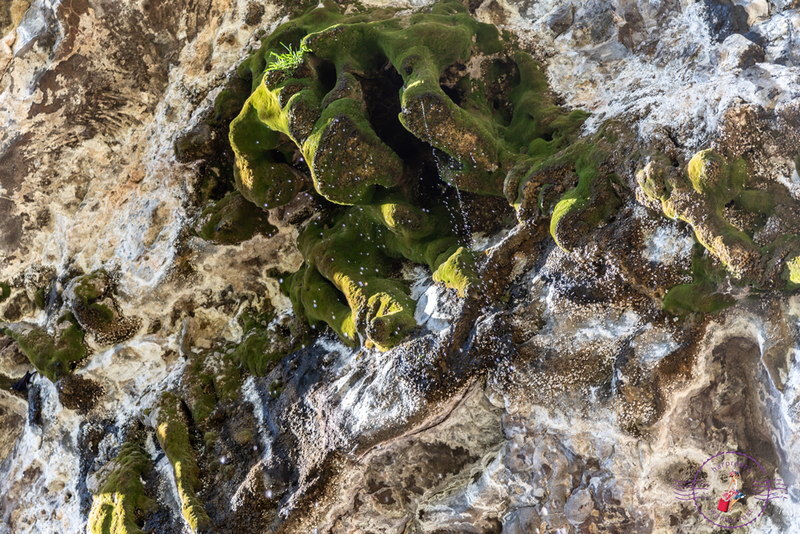 What a beautiful post and I truly felt like I was in that cave with you. Thank you for bringing it to life for me. You really have shared some fabulous hidden gems with us, and I thank you for it. This side of the globe is very firmly on my to visit list, so I will be book marking this post to incorporate in my planning!